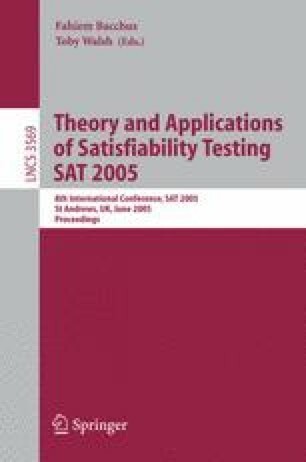 This paper presents a new technique to derive an initial static variable ordering for efficient SAT search. Our approach not only exploits variable activity and connectivity information simultaneously, but it also analyzes how tightly the variables are related to each other. For this purpose, a new metric is proposed – the degree of correlation among pairs of variables. Variable activity and correlation information is modeled (implicitly) as a weighted graph. A topological analysis of this graph generates an order for SAT search. Also, the effect of decision-assignments on clause-variable dependencies is taken into account during this analysis. An algorithm called ACCORD (ACtivity – CORrelation – ORDering) is proposed for this purpose. Using efficient implementations of the above, experiments are conducted over a wide range of benchmarks. The results demonstrate that: (i) the variable order generated by our approach significantly improves the performance of SAT solvers; (ii) time to derive this order is a fraction of the overall solving time. As a result, our approach delivers faster performance as compared to contemporary approaches.